Today was the first full day of the course. I just did a ton of hand writing so figure me for being a little short here. We started out with a class introduction and then went right into teaching methods. We are starting off this week by becoming students before we become teachers. The trainer chose to do a lesson teaching us Korean. We went through input, repetition and functionality. Meaning, he put the lesson in context, then used bubble for dialog that we build on to carry a short conversation and then together as a class, wrote the words ourselves. There was a lot of interaction and participation. The professor did not use English yet by the end of lesson we comprehended a small bit of Korean. We were shown a method that we are soon going to be using on our Thai students and Korean was purposely chosen since we have little or no knowledge of the language so that we are in the shoes of our future students. There is a small break in the morning and then a long 1.5 hour lunch around 11:30. I took this time to pick up a package at the post office that my mom sent me. I was really excited to get some news shirts and underwear as well as my harmonica! The most important thing was the dress shoes for teaching in the classroom, although, footwear is entirely optional in Thai classrooms for foreign teachers. Thai teachers generally must be barefoot. After lunch we went straight back into it with some theater practice. Part of being a new teacher is being able to “fake it until you make it.” This is one place I feel is my strong point as acting has always been fun for me. We did some role playing and some impromptu story telling. It was a lot of fun even though some of the other classmates thought it was stupid. I’ve found a few of the others in the course don’t really grasp the idea that becoming a teacher means being flexible and dealing with surprises. I’ve come in as a blank sheet of paper, open to anything that the trainer throws at me, understanding that the end purpose is for the better. The trainer even went as far as warning us that we would be frustrated and that this is on purpose to challenge us. I’m certain they are seeing how we deal with adversary and using that in our evaluations. It was interesting to find out that the two questions potential employers call references is about is whether or not the student was punctual and they got along with others. This is before experience. These are two strong suits of mine as well so my confidence is pretty high. After we left class most of us stayed in the room to do our daily assignments which consist mostly of reflection on the lessons for the day. I’ve done more writing and reading in the first two days here than some of my entire courses at USF. First job interview is set! After finishing up our assignments most of us went our separate ways. 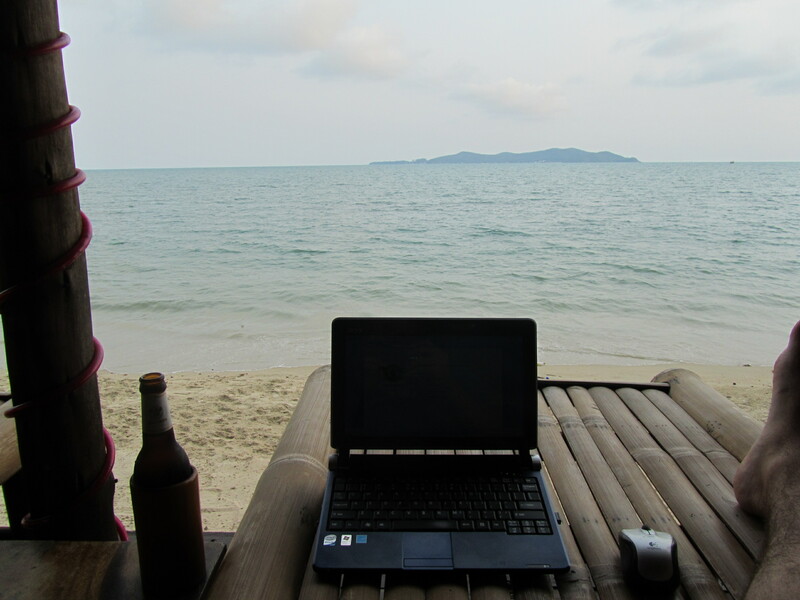 I grabbed my laptop and headed to the beach bar about 30 seconds walk from the classroom to do some more writing and have an ice cold Singha. (Interesting side note: The month of August, my birth month, is called “Singha kom” which literally means lion month) I have been waiting on a reply from the English language school in Northern Sumatra, Indonesia and received it this evening. They apparently liked my application and resume and put me on the short list for the May-June volunteer (with pay) job. They want to set up a Skype interview asap so I have to speak with the administration at my school tomorrow to find out if I can do it there. I’m certain it should be no problem and can’t wait to get my first interview under my belt. 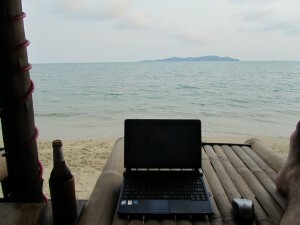 This entry was posted in South East Asia 2011, TEFL Related and tagged ban phe, sumatra, tefl international by jtafuro. Bookmark the permalink. Congrats on the interview!! Sounds like the course will be very beneficial. Enjoy your studies!! Ah, I remember those days! I learned Borucan. It was a good experience to give you the perspective of the confusion, but then to see how you actually can learn another language with these techniques. Have fun in class, and good luck with the interview! !